Petraglia, whose co-workers include Australian and Indian researchers, presented his ideas at the British Science Festival, which is hosted this year at Aston University. 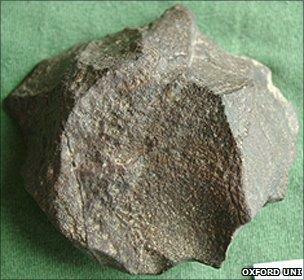 "I believe that multiple populations came out of Africa in the period between 120,000 and 70,000 years ago," he said. "Our evidence is stone tools that we can date." Most of the tools are from far inland - hundreds of kilometres from the coasts. This means it was more likely humans migrated by land than in boats, he said. The tools are found in areas that are often very inhospitable now, but which at the time would have been much more conducive to migration. "During the period we're talking about, the environments were actually very hospitable," he told BBC News. "So where there are deserts today, there used to be lakes and rivers, and there was an abundance of plants and animals." The team found the stone tools - ranging from a couple of centimetres to nearly 10cm in size - in layers of sediment that they can date using sand and volcanic material found above and below the implements. The tools were mainly either spear heads or scrapers. Other species of early humans clearly left Africa before our species (Homo sapiens), but Dr Petraglia's team thinks that the tools it has found are the type made by modern humans - and not those of Neanderthals, for instance. Previous research has leaned heavily on examining the genetics of different modern populations to find out how long ago they shared a common ancestor - their African common ancestor. Professor Chris Stringer, of the Natural History Museum in London, said this genetic data showed humans left Africa around 60,000 years ago or even more recently. He agreed that "these tools show that people were in these regions, but the genetic data show an exit from Africa of later than 60,000 years ago. The people in India could have died out." Dr Petraglia, however, suggested that researching these migrations using population genetics might not lead to accurate results, because all of the genetic studies were based on today's people. The absence of ancient DNA to make additional tests made this area of investigation much less reliable, he claimed. 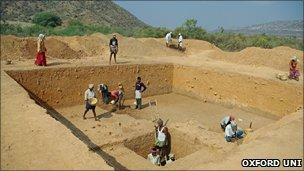 Dr Petraglia's team now hopes to continue its excavations in the region. "We have literally hundreds of projects in Europe and a handful in the Arabian-South Asian belt," he said.